Objectives: Student will learn the definition and the application of value in an artwork. Student will learn tint, shade, highlight and shadow and how to create the illusion of form through the use of value. Delivery of info: Students will be presented with a PowerPoint presentation on value. Students will then complete a seven box value scale with charcoal material. Students will then be required to label highlights and shadows as well as tints and shades. 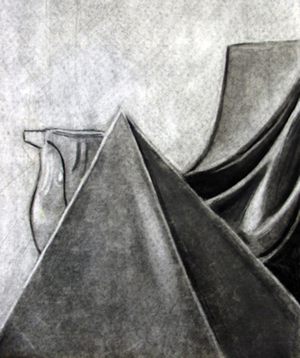 Guided Practice: Students will cover the entire 18" by 24" paper with a layer of vine charcoal. Then using a still life setup at the center of the room, students will erase out the image from observation. Teacher will walk around the classroom and observe and help students as they work and remind students about the properties of value and how it should be used in a piece of art.